before the tip-off, a lot of people must have been saying that there is no way the 76ers would continue their stunning run into the playoffs especially against a team like the detroit pistons. 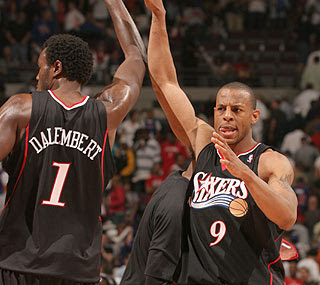 the sixers proved though that they are for real (or at least for one playoff game) after defeating the pistons 90-86 in game 1.
andre miller led the 76ers with 20 points while rasheed wallace led the pistons with 24 points. although the pistons are ready to take on the young 76ers team, they were inconsistent. that enabled the sixers to keep moving in for the kill, which eventually they did. with one win in michigan, the sixers may have had achieved one of their goals in the playoffs. this series would be a roller coaster ride. if iguodala does not choke, look for the sixers to take this series.